Weak, damaged and missing teeth can impact both your dental health and your self-esteem. 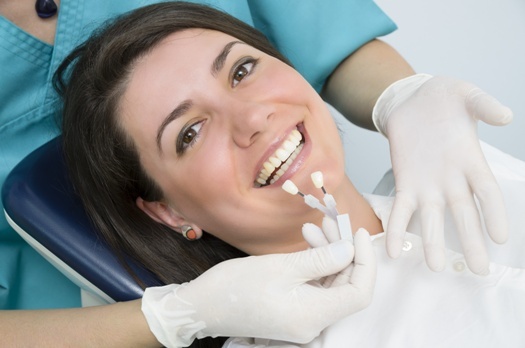 Porcelain crowns are restorative dental solutions that can give you a beautiful, healthy and strong smile that you can enjoy for years to come. To learn more about dental crowns, and if they are the right choice for you, please contact Contemporary Dental Health today online or at 503-636-4069 to schedule an initial consultation with experienced dentist Dr. Keith Ogawa. We help men and women from Lake Oswego, West Linn and Portland, Oregon. Attractive appearance: Porcelain crowns can improve the appearance of your whole smile. With a beautiful, natural-looking crown, you can conceal unsightly dental flaws and smile with greater confidence. Support: Porcelain crowns fortify and support teeth that are weak or damaged by trauma or decay. If you have a tooth that is chipped or cracked, a porcelain crown can hold it together. Customization: A porcelain crown can be precisely tailored to improve upon the shape and color of your existing tooth. Postponing treatment for a damaged tooth will only permit the issue to worsen. Eventually, your broken tooth won’t be able to function properly and more expensive and invasive procedures may be needed. Placing a full crown on your tooth will restore beauty, function and strength to your smile. The best way to determine if a crown is right for your dental needs is to meet personally with our cosmetic dentist, Dr. Keith Ogawa. During your initial consultation, he will examine your damaged tooth or teeth and decide which treatment option is best for you. He will explain your options, answer your questions and address your concerns. When choosing a cosmetic dentist, it’s important to choose someone with the experience, skill and passion for excellence to ensure your results are safe, attractive and long-lasting. Dr. Ogawa is an experienced, LVI-trained dentist with a history of proven success. If you have a damaged, weakened or unattractive tooth and would like to learn if porcelain crowns or other treatment such as porcelain veneers are right for you, contact Contemporary Dental Health today by completing the form on this page or calling 503-636-4069 to schedule an initial consultation with our caring dentist Dr. Keith Ogawa. Our office welcomes patients from Lake Oswego, West Linn and Portland, Oregon.